A game themed around life on the open road, Highway Kings is a five reel and nine payline slot that is sure to especially appeal to petrol heads everywhere. Featuring wilds and scatter symbols aplenty, the relatively simple slot delivers plenty of fun that will help players to forgive the lack of a bonus game. What’s more, a really generous top payline jackpot can also put players on the fast lane to the good life. A generous paytable, additional scatter wins and a relatively high RTP percentage of 97.06% make the chance of winning with Highway Kings comparatively good. The chance to both adjust the number of active paylines and choose between a large number of bet levels gives players excellent control over their stakes. The innovative theme means that the slot offers an almost unique look. A progressive bonus ball sidegame introduces an extra way to win big. 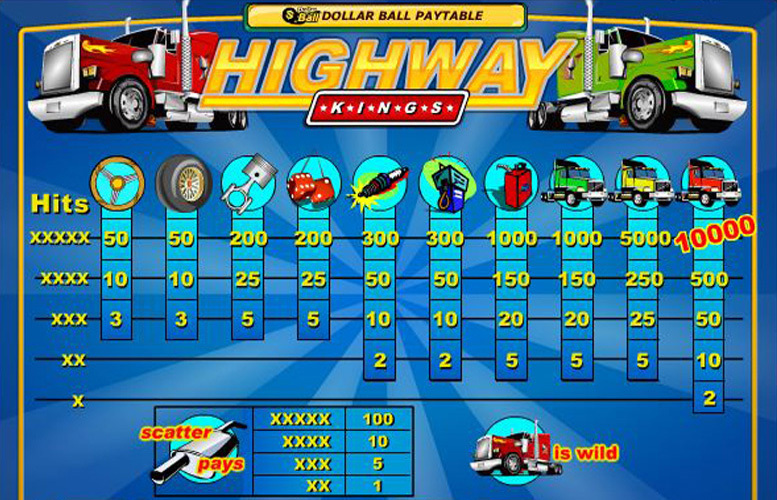 Highway Kings does not include a bonus game or additional round beyond the main game. Gameplay within that main game can get a little repetitive and boring after a while. Graphics are a little old fashioned and low quality. The reels of Highway Kings are populated with a whole host of different symbols related to life on the road, and it is when five matching symbols appear along an active payline that the biggest jackpots result. The most valuable such combination of all is one made up of five of the slot’s red truck wild symbols, which pays at a level of 10,000 times the player’s pre-set bet level per payline. That means that at the highest possible bet level of £5, a lucky player could receive a payline jackpot worth £50,000 if they see five of those symbols line up. As well as payline jackpots, the Highway Kings slot also offers two other ways to win in the shape of scatter wins and an innovative progressive sidegame. Both of those features will be explained in depth below. As we’ve already touched upon above, whilst Highway Kings is a relatively simple slot it does still include a trio of additional features. These are the game’s wild symbols, scatter symbols and unique progressive sidegame. The most valuable symbols on the slot’s reels, the red truck wild symbols also work as regulation wilds. That means that they can substitute for any other symbol on the reels in order to produce the most valuable possible combination along any active payline. What’s more, a combination created in that fashion is worth double the normal payout. It is the symbols depicting an exhaust pipe which are the Highway King slot’s scatters. Those symbols deliver automatic payouts if more than one appear anywhere on the reels after a spin. If five scatters appear at the same time, the payout is worth a lofty 100 times the player’s wager and the amounts decrease incrementally to payout worth exactly the same as the wager for just one scatter. An interesting if a little unusual addition to the Highway Kings slot, players can choose to enable a separate lotto themed sidegame to run concurrently with the main slot. Linked to a progressive jackpot, the sidegame asks players to select five numbers from 1-49 and then draws out five numbered balls as in the case of a lottery. The more numbers that match those chosen by the player, the greater a share of the progressive jackpot they receive. 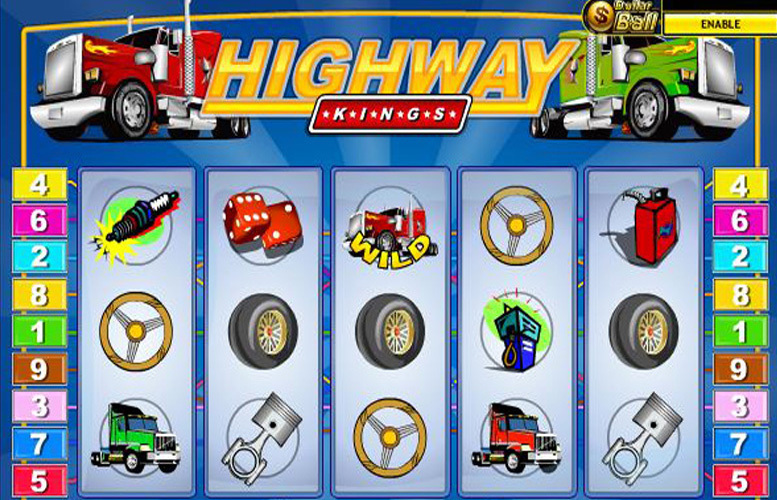 Set amongst the hurly burly of a motorway or highway, the symbols of the Highway Kings slot all feature images of items associated with the open road. Those include things like spark plugs, steering wheels, petrol pumps and different coloured trucks, which are the game’s most valuable symbols behind the red truck wild symbol. A five symbol combination of yellow trucks along an active payline delivers a jackpot worth 5000 times the player’s bet level. Five of the green trucks or five petrol cans, meanwhile, are worth 1000 times their stake to a player lucky enough to see one of those combinations. Highway Kings players who want to adjust the amount they bet per spin have a number of different options. Firstly, it is possible to choose anywhere from one to nine active paylines for each spin and thus to control how much you stake in total in that fashion. Beyond that, players also have excellent control over how much they wish to stake per active payline. The minimum possible bet is set at just 1p per payline whilst the maximum can be as much as £5 per payline, meaning that an overall minimum of just 1p and maximum of £25 is possible to bet. An almost uniquely themed slot that is quick and simple to play, Highway Kings is sure to appeal to motoring fans and to players who want a high paying game that they can play without paying it too much attention. The top payline jackpot of £50,000 at the highest bet level is very generous and additional scatter wins help to make the slot potentially even more beneficial to players. A unique progressive sidegame, too, helps to add a little more interest to proceedings but the lack of a more comprehensive bonus game can make gameplay a little repetitive. This game has a rating of 4 / 5 with 809 total reviews by the users.